ASTM D1998-06 Falling Dart Impact Test: Validates that virgin grade resin is being used and that the molding process is complete and properly done. When punctured, Ace Roto-Mold Float Drums do not crack or shatter. 7-Day Hunt Water Absorption Test: Foam fill will aid in maintaining buoyancy if float becomes damaged. Properly steamed foam creates a tight seal which will prevent waterlogged floats and sinking docks. 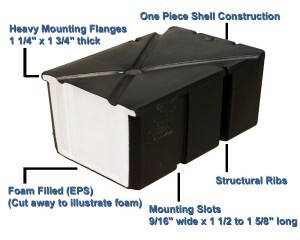 Void-free foam also supports outer shell walls, adding strength. Ace Roto-Mold Float Drums meet or exceed the test standard of 3 lbs per cubic foot. Encasement Wall Thickness Standard: Eliminates weak wall floats with early failure potential and provides an insurance policy against unnecessary repair costs. Ensures floats will hold up to pre and post install abuse. Ace Roto-Mold Float drums have a nominal wall thickness of 0.150" and a minimum thickness of 0.125". Tank Tested Buoyancy Ratings: Calibrated Tank Tested Buoyancy for each model unit is available. US Army Corp of Engineers Regulation 33CFR Part 327.30: Ace Roto-Mold Float Drums meet or exceed the US Army Corp of Engineers standards under Regulation 33CFR Part 327.30. 15-Year Float Drum Warranty: Ace Roto-Mold offers a 15-Year Float Drum Warranty on all of its manufactured float drums to the original owner. Available in White: All floats also available in WHITE upon request for no additional charge.